This is one of the most easily recognized members of the Brassicaceae (mustard) family because of its large and plentiful fruits which have the characteristic cabbage-like flavour when chewed. Like most of the other introduced members of this family, it grows in abundance. 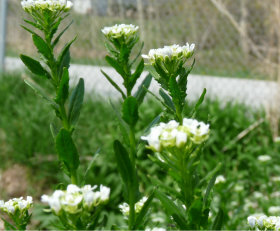 Researchers have begun studying the genetics of pennycress in order to improve its potential use as a biofuel crop. Distinguishing Features: Field pennycress’s oval, flat and widely-winged silicula makes it easy to recognize. When it is flowering the lowest leaves on the stem go yellow, and in dry places they can ripen their seeds even if they are almost leafless. The siliculae stay green for a long time and its long, narrow wing increases its surface area, so the responsibility for assimilation is partly transferred to the fruit towards the end of the plant’s life-cycle. The siliculae develop in abundance and each of them contains dozens of seeds. 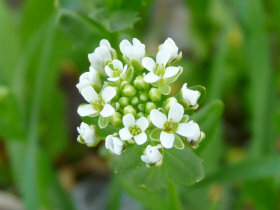 Flowers: This plant has four white petals, clawed, grow up to 4mm long and 1.5mm broad. They are produced in dense racemes that elongate with age. It has six stamens, divided into 2 sets of 3 on either side of the flattened ovary. It has four sepals and flowers from May to July. Fields of Nutrition has medicinal benefits and vitamin/mineral content of Field Pennycress. Leaves: In spring the basal leaves grow in a in rosette, oblong, or narrowly obovate and they can grow to 8cm long and 2cm broad. The petiole is winged. Leaves grow alternate, clasping, lanceolate to lanceolate-oblong, and they are coarsely toothed or lobed. 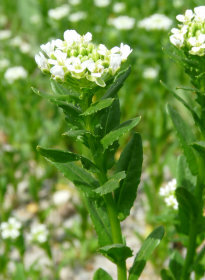 Height: Field pennycress can grow to almost 1 metre in height but typically are about 50-60cm. Habitat: Waste ground, disturbed sites, roadsides, railroads, pastures. This edible is native to Europe. It grows throughout Europe, Great Britain, Bhutan, northern Africa, Japan, Siberia and throughout Canada and the U.S. 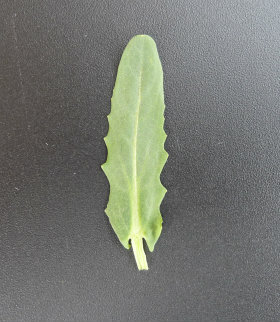 Edible parts: Young leaves can be eaten raw or cooked. They should be harvested before the plant comes into flower or they will be very bitter. 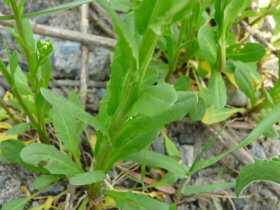 Even the young leaves have a somewhat bitter flavour and aroma, and are not to everyone's taste. They can be added in small quantities to salads and other foods such as in lasagna. They can also be cooked in soups or used as a potherb. For a leaf, it is very rich in protein. The seed is ground into a powder and used as a mustard substitute. The seed can be sprouted and added to salads.